“As a parent I was struggling to get my children aged 10 and 4 even to do the simplest of things such as getting out of bed in the morning. With my eldest it was a yelling session and I was tired before I even left the house each day. A couple of friends recommended the Parent Effectiveness Training course and in April 2003 I attended a program which was one evening a week for eight weeks. During the sessions I learnt about behaviour and how in many instances I was not communicating with my children but using my “power” over them. This was not the way I wanted to parent my children and I was excited to learn tools to assist me to get along better with my children. We learnt listening skills, how to sort out who owns the problem, how to recognise when a child has a problem, assertiveness skills and problem solving and conflict resolution. I also gained an understanding of how children don’t “misbehave” but simply put, are only trying to get their important needs met. I also discovered how I had created communication ‘roadblocks’ which prevented me from being effective with my children. The program has had a very positive effect in my relationship with my children. The morning situation has greatly improved and I am able to talk instead of yell and I felt more confident as a parent. Sometimes things are now done without my asking. It has created a much calmer atmosphere and I am sure that because of doing P.E.T. it will continue to have positive impacts as my eldest child approaches the challenging puberty years. P.E.T. has also improves my relationships with other family members and friends and given me much more confidence. 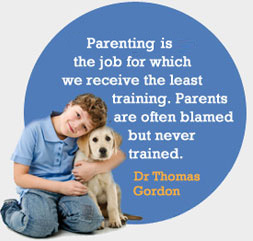 PET has impacted positively in every part of my life and I use the parenting skills learnt everyday in my workplace. How I managed my caseload beforehand I just don’t know!